NRL round 4 : Team of the Week. Home » Rugby league » NRL round 4 : Team of the Week. St George Illawarra's 12-4 victory over the Sea Eagles was a game of very little highlights unless of course you were Dragons fullback Josh Dugan. Responsible for setting up the Red V's only try in the ninth minute, Dugan went on to break seven tackles and run for 222m in his side's second consecutive win. Rona's star continues to rise following his performance against the Wests Tigers in Round 4. His two tries and 151 metres were huge for the Bulldogs, but it was his assist for Josh Morris's first try in almost a year which proved the standout. Six of the seven Roosters backline players scored tries in their dominant win over the Raiders and Jennings was certainly the pick of the bunch. 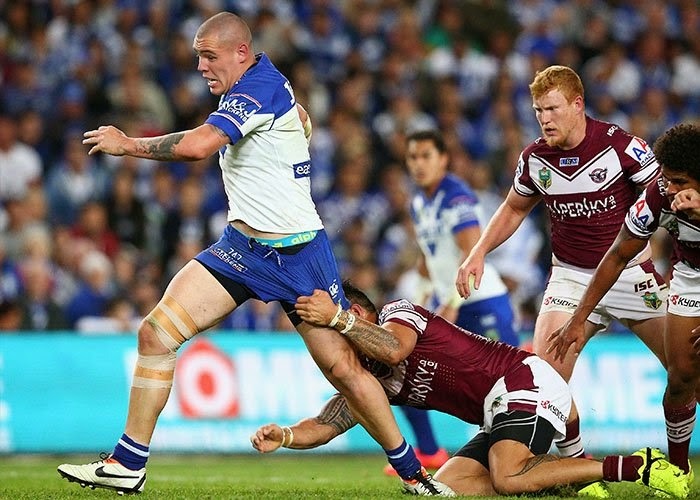 The centre ran for 137 metres, a line break assist and six tackle breaks. One of the best in a beaten side, Mann once again showed why he's keeping Mahe Fonua in the Intrust Super Cup. Mann's 113 metres and try against the Cowboys on Monday night was another demonstration why Storm coach Craig Bellamy continues to put faith in the 22-year-old. The Eels' win over the Rabbitohs was one Robinson won't forget anytime soon. Beating the previously undefeated Rabbitohs is one thing, but scoring your 50th NRL try during your 100th NRL match is a moment which is sure to stick with the winger for a long time. With incumbent New South Wales five-eighth Josh Reynolds currently out injured, Maloney kept up the fight for a NSW Blues jersey after coming up with a long-range try, a try assist and two tackle breaks in the Roosters' big win over the Raiders. Two clutch field goals on either side of fulltime in North Queensland's golden point victory over Melbourne was enough for Thurston to earn Team of the Week honours. If that wasn't enough, Thurston's try assist, three tackle breaks, two line break assists and sideline conversion in the final two minutes to keep his team ensured he earned his spot. Lussick has finally found some much-needed consistency in his game. The aggressive prop's 129 metres and 28 tackles left the might of the Rabbitohs' forward pack reeling. Lichaa made Wests Tigers duo Lamar Liolevave and Brendan Santi look silly as he ducked and weaved his way over the tryline to kick-start the Bulldogs comeback. It was his 59 tackles which stuck out most in the heat of battle. Vice-captain Aiden Tolman is the gift that keeps on giving for Bulldogs fans. Against the Wests Tigers on Friday night, the consistent prop smashed out 160 metres and 54 tackles in the Bulldogs' golden point victory. Penrith captain Peter Wallace is still trying to get the feeling back in his torso following his meeting with Knights enforcer Beau Scott. Earning the tag as the best halfback bully in the NRL, Scott's eight tackle breaks and 33 tackles rounded out his performance. Having been promoted to the starting team less than an hour before kick-off, Houston went on to play the entire 80 minutes, score the first try of the match, run for 100 metres and produce 54 tackles. The Kiwi wrecking ball punched his way through 243 metres, five tackle breaks and 18 tackles against Melbourne. Amazingly, he did it all in just 57 minutes. Paul Gallen's Sharks may be out of form but the man himself isn't. The catalyst behind Cronulla's second try midway through the first half thanks to a line-break assisting offload, Gallen finished the game with 212 metres and 39 tackles. The diminutive halfback orchestrated a win over his former side and reigning premiers South Sydney. A field goal and try from Sandow in the final four minutes of the game left him and the Eels looking like world beaters. Sandow was involved in everything and just edged out Mitch Pearce for a spot on the bench this week. In just his second game of 2015, Bird was a constant source of inspiration in the Titans' first win of the year. The NSW and Australian back-rower produced 133 metres and 30 tackles in the Gold Coast's two-point win over Cronulla. After producing 144 metres, a try assist for teammate Jarrod Wallace, six offloads and 26 tackles, Parker earned man-of-match honours in the Broncos' win across the ditch and more importantly - a spot in NRL.com's team of the week.